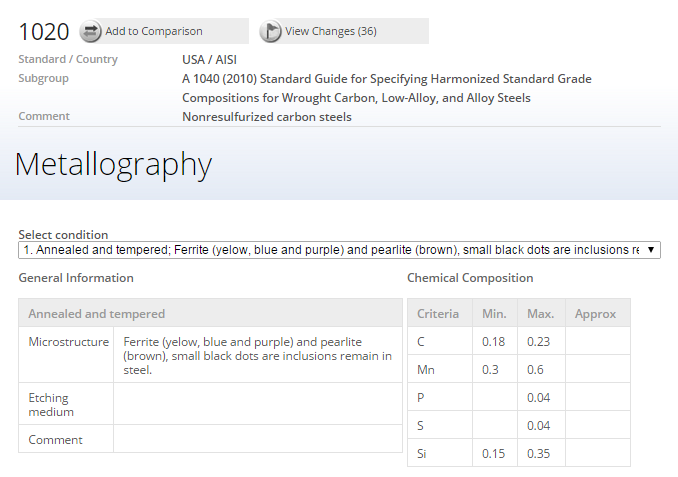 Strengthened primarily by grain refinement and with relatively simple chemical compositions, ultra-fine grained steels have a great potential for replacing alloyed high strength steels. The main benefits are avoiding additional alloying elements, skipping complicated additional heat treatments like soft annealing, quenching and tempering, and improving weldability owing to the reduced required content of carbon and other alloying elements. Steel is nowadays a very suitable material for many structural uses because of its low cost, good formability, variable strength with good toughness, and good weldability. Among the different strengthening mechanisms, grain refinement is the only method to improve both strength and toughness simultaneously. Therefore, ultra-fine grained steels with relatively simple chemical compositions, strengthened primarily by grain refinement, have a great potential for replacing alloyed high strength steels. The main benefits behind such a strategy are to avoid additional alloying elements, to skip complicated additional heat treatments like soft annealing, quenching and tempering, and to improve weldability owing to the reduced required content of carbon and other alloying elements when compared with high strength quenched and tempered steels. A further high potential area of ultrafine grained steels is the domain of high strain rate superplasticity at medium and elevated temperatures. In general, the term ultrafine grain is used for average grain sizes between 1 μm and 2 μm in diameter. The term submicron structure refers to grain sizes between 100 nm and 1000 nm; and the term nano-structure means grain sizes below 100 nm. 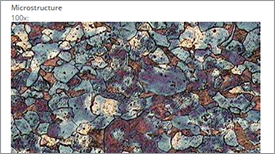 The formation of ultra-fine grained steels is an area of intense research around the world. 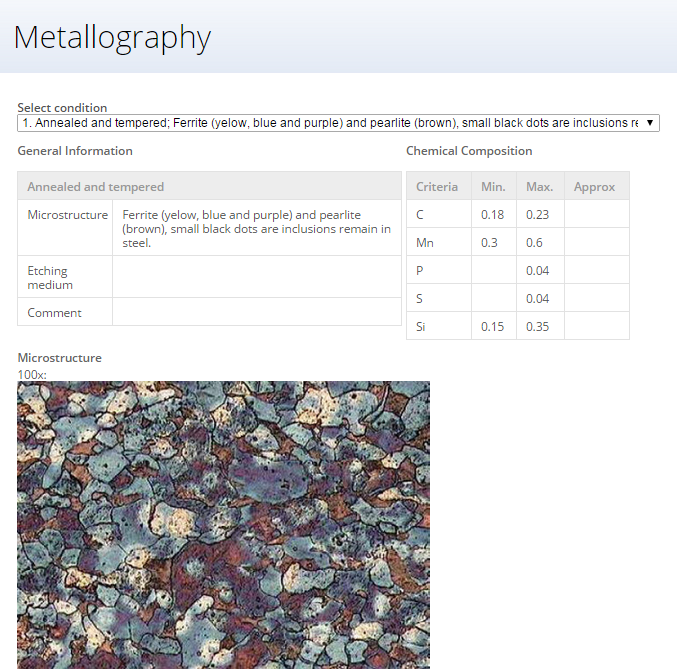 There are a number of methods to produce grain sizes of approximately 1 µm, ranging from extreme thermal and deformation cycles to more typical thermomechanical processes. 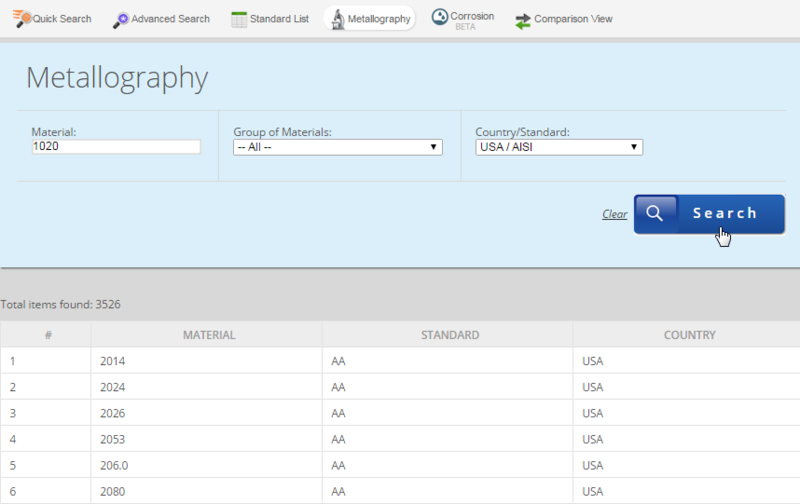 It has been shown that a deformation is required within the Ae3 to Ar3 temperature range for a given alloy. The formation of ultrafine ferrite involves a dynamic transformation of a significant volume fraction of the austenite to ferrite. This dynamic strain induced transformation arises from the introduction of additional intragranular nucleation sites. It is possible that the deformation also hinders the growth or coarsening of the ferrite and may also lead to dynamic recrystallization of the ferrite. The most likely commercial exploitation of ultrafine ferrite would appear to rely on the formation of a critical volume fraction of dynamic strain induced ferrite followed by controlled cooling to ensure this is maintained to room temperature and to also form other secondary phases, such as martensite, bainite and/or retained austenite to improve the formability. For attaining the finest grain size of 0.25μm or for attaining the limit grain size of 0.1 μm, there is so far no such production technology available yet. There is a development in working materials using with severe plastic deformation methods, e.g. 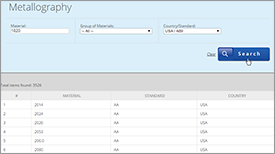 ECAP (equal channel angular process), ARB (additive roll bonding), MAF (multi-axes forging), SMAT, HPT, and so on. Figure 1 schematically shows their concepts. 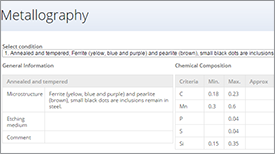 By using these methods, it is possible to obtain small pieces of samples with ultra-fine grain microstructures of sub-micrometer or nanometer scale. In 2001, Nükura briefly described new methods to obtain ultra-fine grain steels based on TMCP technology. 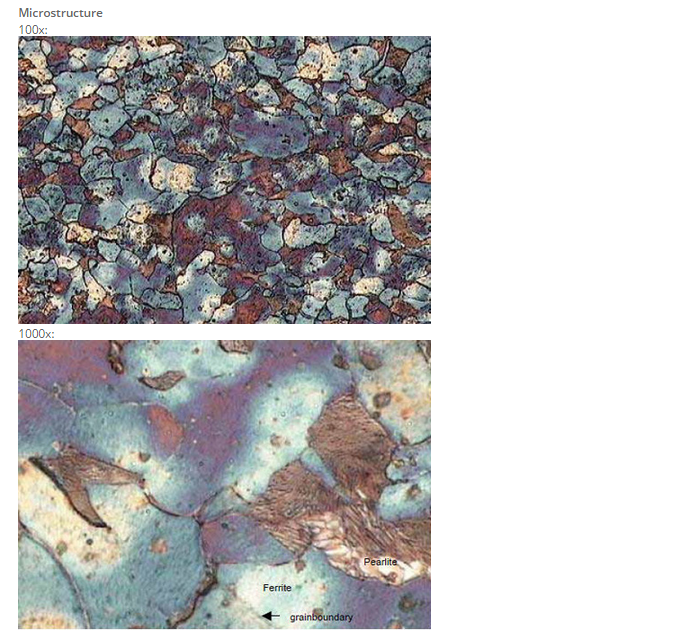 Three methods have been applied which can result in grain size in the micrometer scale and in the double strength level (Figure 2). After the proper micro-alloying designing, the steel should undergo two stages of controlled rolling. During the rolling within this temperature range, making it hard to recrystallize; because of the clustering and precipitating of alloy elements such as Nb, Ti, B in the deformed matrix, large amounts of distortion accumulation is produced in the deformed austenite, and the dislocation density rises rapidly. After the final rolling, the steel plate is cooled in the air at 2°C/s. 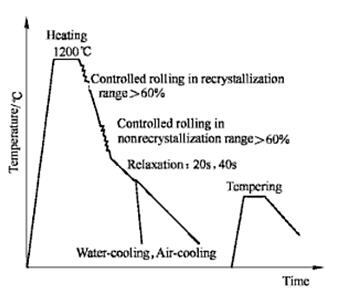 During cooling, the deformed crystal will revert and polygonize, and the deformed dislocations will re-arrange or disappear. This reverting results in the dislocation cell substructures (or subcrystals) formed in the deformed austenite with diameters of 3-5 μm. With the continual adding of the deformed dislocations, the included angle between subgrains will increase, and micro-alloying elements such as Nb, Ti, B will non-equilibrium segregate and precipitate (deformation induced precipitating) on the boundary of the cell structure consisting of dislocations. After the relaxation control above, the steel plate is quenched directly or subjected to accelerate cooling. Because there are large amounts of substructures and precipitates (especially those precipitates which have large size and lose the coherency with the matrix in deformed grains), interfaces between them and the matrix will become advantageous places for phase transformation. During the cooling, new phases will be formed firstly on them; these preferentially formed acicular ferrite or bainite in the crystal, partition the original austenite grain into different zones. 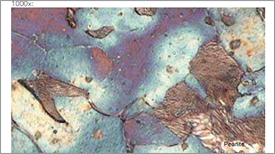 When bainite and martensite transform in each substructure during further cooling, their lathe length is hampered by the subgrain boundaries and acicular ferrite or bainite formed in the early stage, which makes the lath structure thinner and shorter, achieving the ultra-fining of the microstructure. 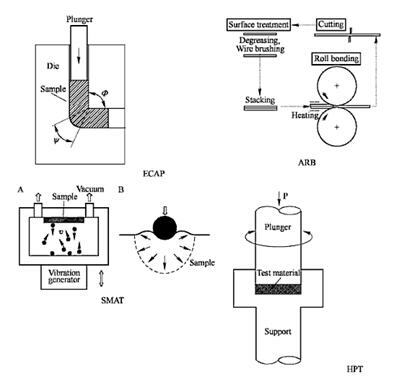 The technological process is shown in Figure 3. In the stage of controlled rolling, enough deformation should be guaranteed so that the original austenite grains will be fined and enough defect density will be accumulated in the deformed austenite. After the final rolling, the steel plate will be air cooled continuously for a predetermined time. The air cooling time is the relaxation time, and the air-cooling end temperature should be above the temperature Ar1. After the relaxation, the steel plate is subsequently subjected to accelerated cooling or direct quenching. In order to make the strength, toughness and elongation percentage uniform and to improve overall properties, the steel plate should be tempered after rolling.